Actress Angelina Jolie has returned to work as a humanitarian a month after stunning the world with her double mastectomy revelation by jetting off to Jordan in celebration of World Refugee Day. On Tuesday she traveled to the Middle East for an official visit as an ambassador with the United Nations. The actress met with a number of women and children fleeing war-torn Syria, and listened to their stories as they expressed the pain of losing their homes and loved ones amid the hostilities. She also spoke with Major General Hussein Al-Zyoud, who helps control the border between Jordan and Syria, and called for more humanitarian aid ahead of World Refugee Day on Thursday. 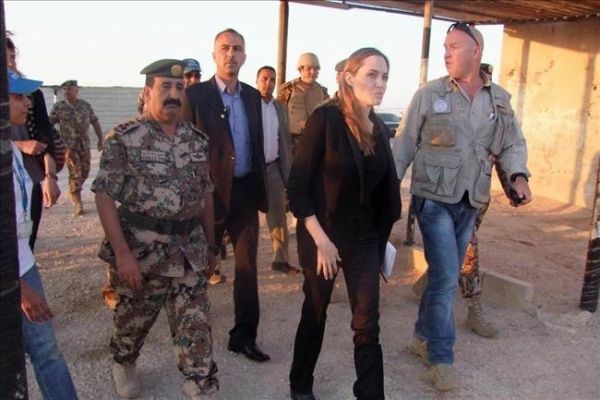 Jolie last visited the Jordanian border in December. United Nations High Commissioner for Refugees (UNHCR) Special Envoy, actress Angelina Jolie speaks with Syrian refugees in a Jordanian military camp based near the Syrian border. AMMAN: Oscar-winning actress Angelina Jolie urged the international community to boost aid to Syrian refugees hit by what she called “the worst humanitarian crisis of the 21st century,” a UNHCR statement said yesterday. Jolie, who is UNHCR special envoy for refugee affairs, visited the Jordan-Syria border overnight accompanied by head of UN High Commissioner for Refugees Antonio Guterres. During their tour the two met Syrian refugees and heard how they had escaped their war-ravaged homes for Jordan. “By the end of this year half of Syria’s population — 10 million people — are expected to be displaced and in desperate need,” the Hollywood star was quoted as saying in the UNHCR statement. “The worst humanitarian crisis of the 21st century is unfolding in the Middle East today,” Jolie said, adding that the “the international response to this crisis falls short of the vast scale of his human tragedy”. “Much more humanitarian aid is needed, and above all, a political settlement to this conflict must be found,” she said ahead of today’s World Refugee Day. Jolie said her visit was intended “to show support for Syria’s refugees, to call on the world to address their plight, and to better understand needs in Jordan and other countries in the region most directly affected by this devastating conflict”. Jordan says it is home to 540,000 Syrian refugees, 150,000 of whom are housed in the Zaatari camp in the kingdom’s north, near the border with Syria. “The international response to this crisis falls far short of the vast scale of this human tragedy,” declared Ms. Jolie, who travelled to the Jordan-Syria border to sound the alarm about the staggering number of people forced to their flee their homes – estimated by the UN High Commissioner for Refugees (UNHCR) at some 1.6 million, 540,000 of whom are in Jordan. Along with Jordan, other countries hosting refugees sparked by two years of fighting between the Syrian Government and forces seeking to oust President Bashar Al-Assad include Lebanon, Turkey, Iraq and Egypt. UNHCR estimates that the number of refugees could reach almost 3.5 million by the end of this year. The conflict has also left more than 93,000 people dead and another 6.8 million in need of humanitarian assistance. Earlier this month, UNHCR updated the amount of funds needed for the Syria Regional Response Plan to almost $3 billion for international agencies and non-governmental organizations (NGOs). An additional $830 million is needed for the Governments of Jordan and Lebanon. Making her visit to the region just ahead of World Refugee Day, marked annually on 20 June, Ms. Jolie listened to the stories of men, women and children who had fled Syria just hours before. In a press release, the agency said that the envoy arrived in the country yesterday with UN High Commissioner for Refugees António Guterres. Mr. Guterres started his visit to the region in Lebanon, where he met with refugees and Government officials. In Jordan, he and Ms. Jolie plan to meet with Government representatives and refugees living in Jordan’s cities, as well as in the sprawling Za’atari refugee camp. “Much more humanitarian aid is needed, and above all, a political settlement to this conflict must be found,” Ms. Jolie said, urging the world to do much more to help the people of Syria. Actress Angelina Jolie on Wednesday visited war refugees near the borders of Syria and Jordan, the United Nations announced in an emailed news release. "Ms. Jolie listened to the stories of men, women and children who had fled Syria just hours before," the UN said. “The international response to this crisis falls far short of the vast scale of this human tragedy,” Jolie said in a prepared statement. “Much more humanitarian aid is needed, and above all, a political settlement to this conflict must be found." The UN estimates about 3.5 million refugees could flee to other countries by the end of 2013. In addition to Jordan, nations impacted by refugees include Lebanon, Turkey, Iraq and Egypt. "The conflict has also left more than 93,000 people dead and another 6.8 million in need of humanitarian assistance," the UN said. "Earlier this month, UNHCR updated the amount of funds needed for the Syria Regional Response Plan to almost $3 billion for international agencies and non-governmental organizations (NGOs). An additional $830 million is needed for the Governments of Jordan and Lebanon." Jolie's visited the border the day before World Refugee Day, an annual UN day set for June 20. OSCAR-WINNING actress Angelina Jolie has urged the international community to boost aid to Syrian refugees hit by what she called "the worst humanitarian crisis of the 21st century," a UNHCR statement says. "By the end of this year half of Syria's population - 10 million people - are expected to be displaced and in desperate need," the Hollywood star was quoted as saying in the UNHCR statement. "The worst humanitarian crisis of the 21st century is unfolding in the Middle East today," Jolie said, adding that the "the international response to this crisis falls short of the vast scale of this human tragedy". "Much more humanitarian aid is needed, and above all, a political settlement to this conflict must be found," she said ahead of Thursday's world refugee day. Jolie said her visit was intended "to show support for Syria's refugees, to call on the world to address their plight, and to better understand needs in Jordan and other countries in the region most directly affected by this devastating conflict". Jordan says it is home to 540,000 Syrian refugees, 150,000 of whom are housed in the Zaatari camp in the kingdom's north, near the border with Syria. More than 1.6 million Syrian refugees have sought refuge in Lebanon, Jordan and Turkey since the beginning of an uprising against President Bashar al-Assad in March 2011, the UN says. It says the fighting in Syria has killed more than 93,000 people so far.